Review of the LG Optimus Me: Is This Cheap Android Phone Worth Your Money? Cheap and low powered smartphones have been the bread and butter of Android enthusiasts on a low budget, or the first-time smartphone user. Some cheap smart phones are pretty lame, some are pretty good despite their low specs, others are amazing phones that come at an amazingly low price tag. So we're here today to determine which category the new LG Optimus Me fits into — garbage low-end phone, good low-end phone, or awesome low-end phone. The Optimus Me is not a particularly cheap option considering its low-end pedigree; at $229 without contract, it's significantly more expensive than its predecessor the LG Optimus P500 and other excellent low-end budget smartphones, such as the Samsung Galaxy 5 or the new Samsung Galaxy Mini. So keeping the $229 price tag in mind, we're about to see if the LG Optimus Me is up to snuff, or not. LG would like us to believe that the Optimus Me is a youth oriented phone — nothing screams "cool" like the option to select differently colored back covers right? You can select the colors black, grey, pink, blue and red. None really have the unique distinction the Huawei Ideos U850 has. They look jaded and out of focus really — the only good-looking back cover is either red or silver. Either way the phone's techies didn't bother going through too much pain in order to slim down the phone, as the dimensions of 108 x 53 x 12.5 mm clearly points out, nor is it the lightest smartphone around, as it weighs a pretty hefty 132 g. Even one drop onto a concrete pavement will spell doom for this phone, although the soap-like design and rounded corners assure it will fit easily in the palm. At the front we have a 2.8 inch QVGA capacitive touchscreen that supports 262,000 colors and a resolution of 240×320. Beneath the screen we have the four touch-sensitive buttons of: Settings (despite the fact that it looks like a window minimizer), Home, Back and Search. It has to be said, the touch-sensitive buttons could have been more sensitive; they feel rather resistive when touching, overall making it not the best sensitivity for its category. Then we have the oddly elongated rocker style Call and End call buttons, holding down the End call button switches off the phone. The unique aspect of this design is the fact that holding down both the Call and End call buttons at the same time serves as the lock function, so no small, hard to press lock button here. It works pretty smoothly and is also comfortable. On the left side we have the covered microUSB port, the right side houses the volume rocker and at the top we find the 3.5 mm headphone jack; you'll have to rely on a virtual shutter key to take pictures. The back has nothing but the round 3 MP camera lens. The user interface is typical Android with minimal interference from LG's Optimus UI, which tends to show up in the form of certain widgets, a few tweaks in the pull down bar, the dialer, and menu option button. It's nowhere near as complete and easy to use as Samsung's TOUCHWIZ for Android and is far, far behind any iteration of the HTC's Sense UI. But otherwise you have a standard Android 2.2 (Froyo) experience, without the added benefit of Flash, due to the low processor speed. The slow processor shows its effect throughout the user interface, particularly if you swipe through the seven available homescreens very quickly. Lags are both constant and very annoying; running two apps at the same time can force the phone to freeze. The screen size and resolution means icons appear a bit blurry and rather dark, plus texts appear grainy. So overall it's a pretty poor show from both the screen and the processor — it's nowhere near as amazing as the Samsung Galaxy 5, despite running on the same exact specifications. You get the standard Android phonebook with entries only limited by the amount of internal memory available, plus multiple field entry, photo, video and ringtone tagging. Social networks are fully catered for via pre-installed Facebook, Twitter and MySpace apps, but this is Android, so you'll proverbially get whatever app you desire. Speaking of available apps, you should take into account that the screen resolution renders some apps from the Market unusable on the LG Optimus Me. Messaging is fully catered for as well via SMS, MMS, email and IM. The QWERTY keyboard is rather small and cramped for comfortable typing, the lack of Swype is sorely missed here — in landscape mode things get better as the virtual QWERTY has an island-style layout, but is again too small to comfortably add corrections or type on quickly without making a ton of errors. Your best bet here is to download any number of available keyboards from the Android Market. In cheap Android smartphones, features are not expected to impress, but there is a dim hope that functionality might just shine through. Since that's not the case, as we've just discovered in the user interface section, let's hope this section can give the Optimus Me some performance based redemption. The phone is a globe-trotting GSM phone, that uses the frequencies of 850, 900, 1800 and 1900 for calls and HSDPA (3G) quad frequencies of 900/2100 and 850/1900 for high speed connectivity. Local connectivity is handled via Bluetooth 2.1 with A2DP and EDR, microUSB 2.0 and Wi-Fi (802.11 B/G). The phone is powered by a 600 Mhz processor by Qualcomm, 140 MB of internal memory and 215 MB RAM. The 3 MP camera is pretty bad, even by the low-end standards this phone flaunts. Pictures turn out muddy and strong colors look washed out, plus you don't get much in the way of shooting options. You have the basics of a self timer, white color balance, ISO and shooting effects such as Negative, Mono, Aqua, Solarize, Sepia and fun frames. No face or smile recognition, or anything fancy at all — at least Geo-tagging is available. The camcorder on the other hand, has some pretty good specs considering it's a low budget phone. You can shoot videos at a maximum resolution of 320×480 in VGA at 24 FPS, but despite the rather promising FPS speed, videos turnout grainy and extremely pixilated. So it's a pretty poor showing in the camera department all around. At least the multimedia fares better; you get the standard Android music player with absolutely no skinning efforts from LG, the sound quality is pretty good on low to medium levels of volume, but turn it to high and things just become a loud screech. Supported musical formats are MP3, WAV, WMA and eAAC+. You also have a pretty bare bones FM radio with RDS, but not the recording option that Samsung makes available for most of its touchscreen phones, you'll need a pair of earphones plugged in as they act as an aerial for the radio. Watching videos is not a painful experience, as long as you manage to keep your videos at the 480×800 resolution mark or under, plus the phone does something rather rare, it plays XVID/DIVX videos ( in VGA) right out of the box. Video quality ranges from acceptable to okay-ish, but you may occasionally get out of sync audio if the file size is large ( over 800 MB) and quality settings are on high. As for miscellaneous features, the phone comes bundled with the excellent Thinkfree office document viewer, a stopwatch, GPS, Java, Accelerometer, proximity sensor, calendar, world clock, voice memo, Google maps, a digital compass, a YouTube app and an organizer. Call quality on the Optimus Me is averagely good if you're listening to calls; while you might sound rather muffled to people on the other line, this is primarily due to the badly placed mouthpiece, but otherwise calls sound averagely good on either end. The loudspeaker fares pretty much the same, the only real difference being that call quality does not distort when the volume is turned up. Web browsing, though easy and intuitive, is hampered by the screen. Texts are simply too small and grainy to read un-zoomed, while zooming-in makes them far too big. Therefore cutting away most of the webpage, the multi-touch ( AKA pinch-to-zoom) capability helps slightly, but overall it's a pretty slow and hampered experience — besides, websites with Flash elements always show up with "Plugin Missing" messages, which only serves to makes you feel like you've bought an inadequate phone. Battery life is exactly average; the Li – Ion 1250 mAh battery can last up to a day on average use, whereas super-extreme frugal use can give you about two days of battery life, but on average you'll be charging the phone once a day, everyday. Although the stated talk time is seven hours on 3G, five and a half hours is a more accurate estimate, while 2G talk time is indeed seven hours. 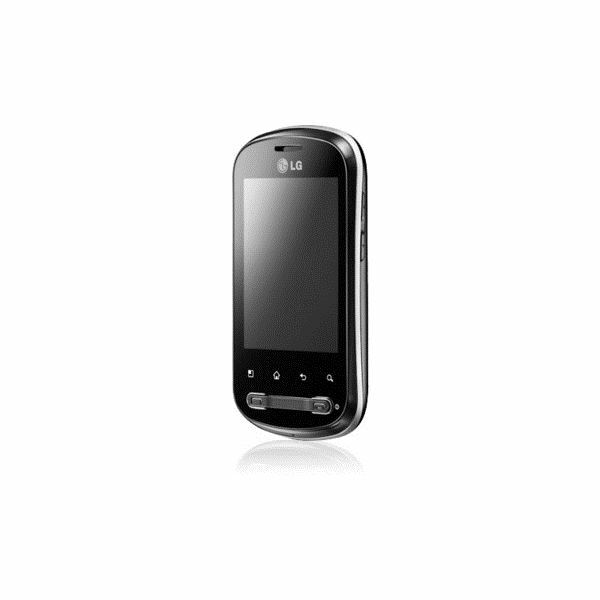 The LG Optimus Me is nowhere near deserving of its "Optimus" name. The phone's pricetag of $229 suggests an average to good performance, while the phone performs average to bad. The laggy screen, unremarkable performance, poor camera, and bad browsing experience, put it behind its much cheaper siblings and rivals. If you're buying a cheap smart phone, go for the Samsung Galaxy 5, the ZTE Blade, Samsung Galaxy Mini or even the original LG Optimus P500, either way you'll be better off than buying the Optimus Me — a cookie cutter phone. Image credit from LG, via URL above.